Pieter Hendrik (“Henk”) Zijderveld was born on July 14, 1900, in Arnhem, The Netherlands, as the elder son of Cornelis Zijderveld (1868-1946, to the right), headmaster of a high school in Arnhem. They are descendants of my ancestor Joost Zijderveld (1822-1893). Henk's mother, Levina Cornelia Josina de Smit (1896-1956) was his father's second wife. His younger siblings were born in the period 1901-1907. Additionally, Henk had an elder half-sister Hendrika Pietertje Zijderveld (1894-1985). 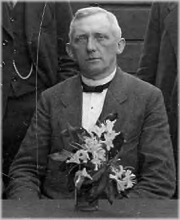 In July 1921 an engagement was announced between Henk Zijderveld and N.H.J. (“Nelly”) Vink, while he was still studying to become a mining engineer. Apparently their marriage was postponed until after his graduation in June 1924. Henk and Nelly were finally married by proxy on October 2, 1925, in Oruro, Bolivia. They were to have several children. On March 25, 1939, in Oruro Henk Zijderveld was married to his second wife, Isabella (“Isa”) Lora. That same year on August 21, 1939, in Oruro, Henk's youngest sister Jacoba Suzanna (“Ko”) Zijderveld was married to Jan Boost. Around 1980 Ko was living as nun “Soeur Jacoba” in Jerusalem, Israel. In the summer of 1992 Jacoba was living in Neuchâtel, Switzerland. Henk Zijderveld died on January 10, 1963, living Isa Lora as a widow.